We made it! Today we will look at (and vote upon) our finalists for our latest contest — to reimagine an XFL jersey if the team (and league) were still in existence today. All the details for the contest are here, and if you missed it, the first set of entries are here and the second set are here. I’d like to again thank our partner, Steve Rosenbeck of Garb Athletics for providing the winner of the contest (as selected by you, the readers) with a custom jersey based upon the winner’s submission. I took a screen shot yesterday of the second round of the voting which you can view here — congratulations to our second three finalists: Ben Polizzi, Hix Myrick and George Miller. Their submissions have been added to the first three finalists (Aaron Jaffe, Sergio DaSilveira, and Michael Candelmo), who advanced last weekend. With that, lets look at the submissions from our six finalists. The submissions will be listed alphabetically. Click to enlarge. Descriptions (if any) will be provided below the submission. Good luck to all (and thanks to everyone who participated!). For this round of voting you may vote for ONLY one submission (and remember the rules stipulate you’re considering the jersey only) — so make sure you pick the best! The winner will be declared next weekend! Once again — good luck to our finalists. Reminder to our readers: you may vote for only one design, and you can only vote once, so choose wisely! I’ll close the voting down on Tuesday night so (hopefully) Steve can begin work on the winner’s jersey in time for a video/pics next weekend. Due to having a lot of Saturday content, I really haven’t previewed any NCAAFB unis this season, and most of the throwbacks, one-offs and other assorted clownsuits one-and-done unis this season haven’t been all that great. 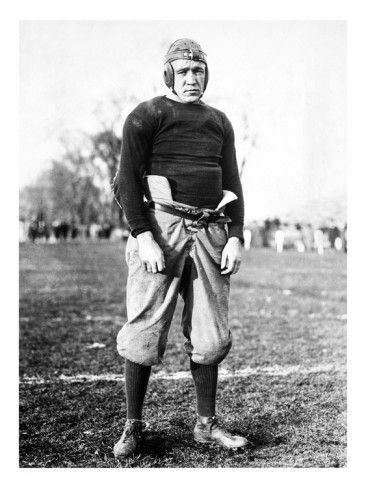 But I’m actually really looking forward to seeing how Notre Dame handles their “Knute Rockne” throwback uniforms, which they’ll be wearing today against Navy. 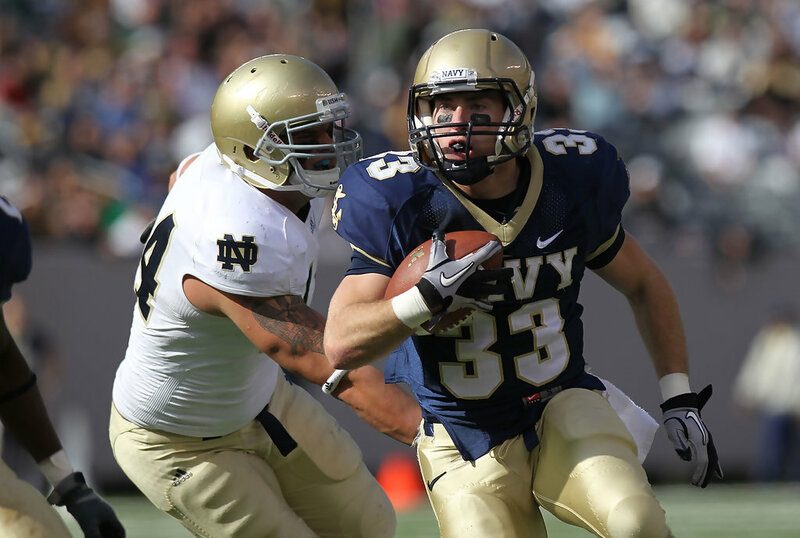 Now, up until Under Armour took over both schools uni contracts, a typical game between Navy and Notre Dame looked like an intersquad scrimmage, but recently it’s been a bit easier to tell the teams apart. Not much, but a bit. That all changes today. 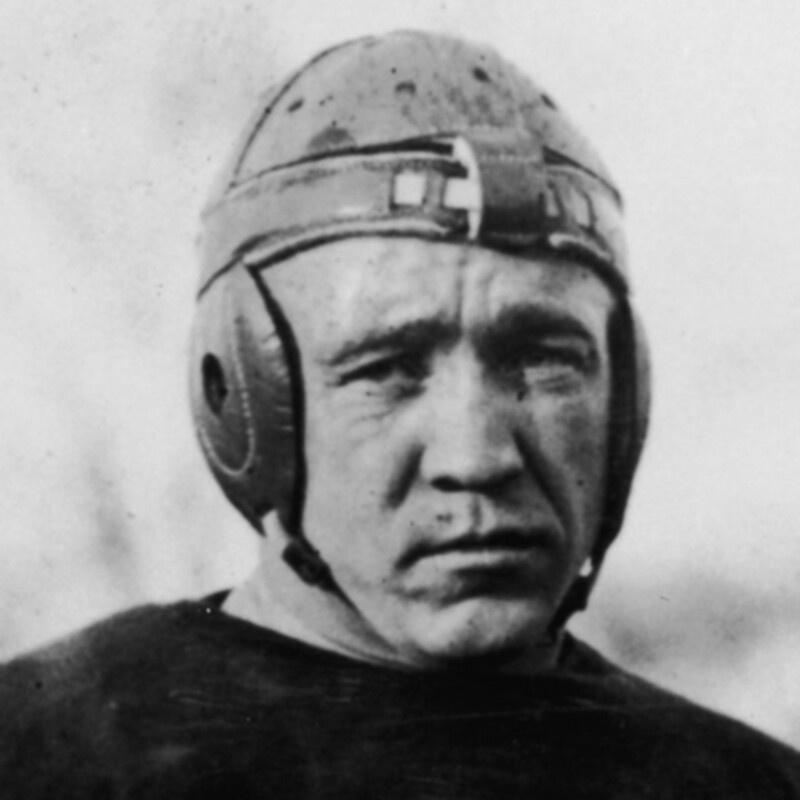 As you can see, they’ve attempted to sublimate the helmet straps that were prevalent when Knute and Notre Dame rocked a leather bucket. Up close, it looks pretty cool — we’ll have to see how it appears on the field. 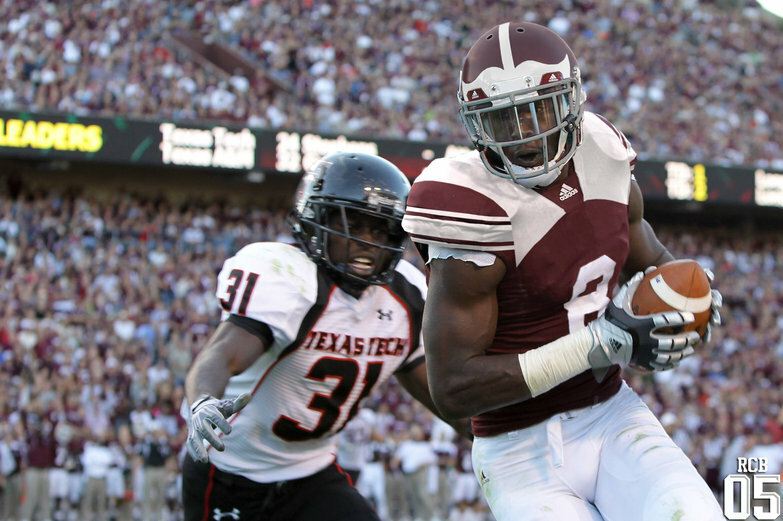 ND isn’t the first school to try to replicate a throwback hat — Texas A&M did it with pretty pretty good results. 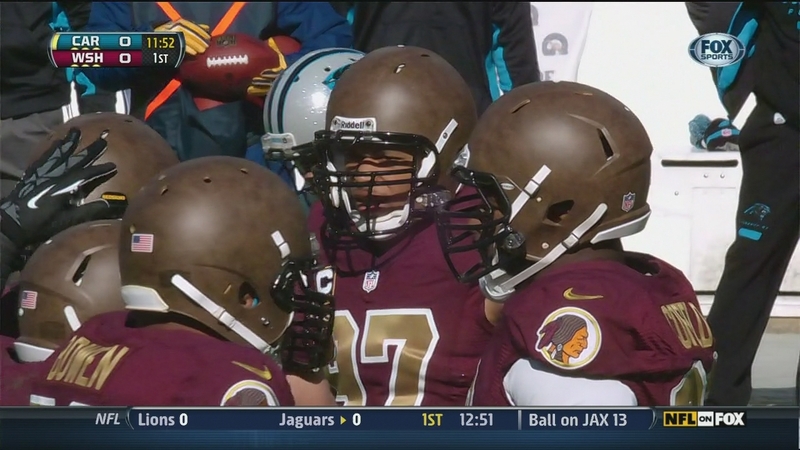 On the pro level, the Washington football team also attempted a fauxback leather bucket, with decidedly less impressive results. These, too, are meant to approximate the cleats worn during Rockne’s day. As with any special uni, I’ll need to see how it looks on the field, but I am looking forward to this one. We all know that some fauxbacks don’t always look that great on the field. Here’s hoping these look better. NFL and Pro Football News: The Browns will blow the dust off their brown jerseys for Sunday’s game against the Jags (from Robert Hayes). … The Packers are pulling out their Acme Packers throwbacks for this weekend’s game against the Ravens. Here’s a cool video featuring the “First Lady of the Packers,” seamstress Marge Switzer. 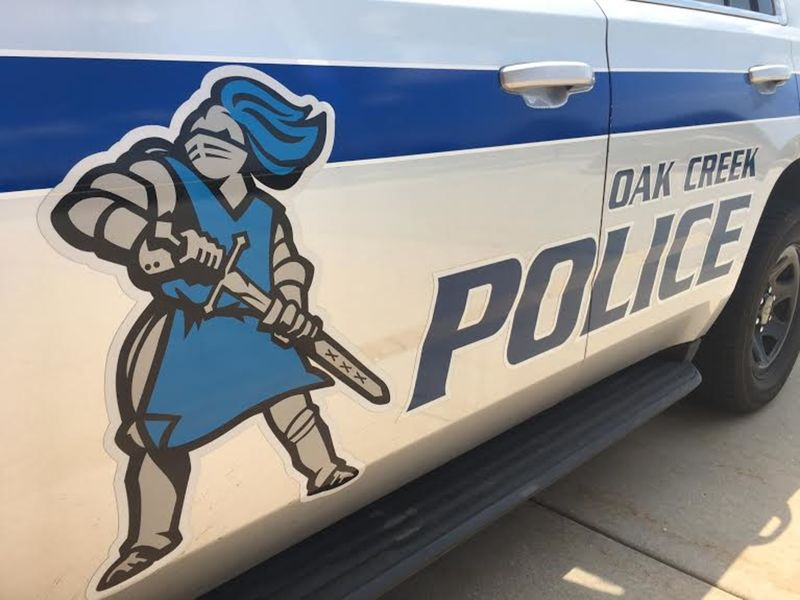 More pics here (from Jeff Ash, Randy Koehn and @JohnnyOleven). 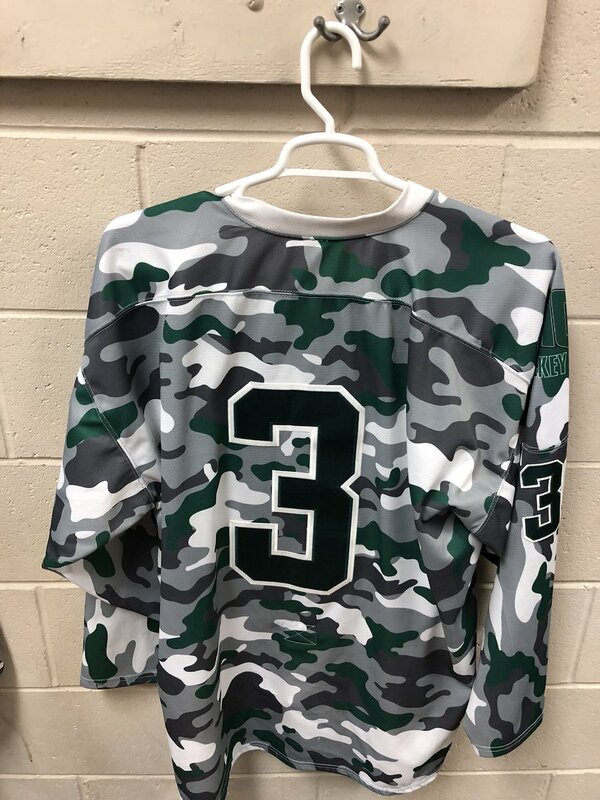 … The Richmond Roughriders of the newly-launched American Arena League have released their uniforms (thanks, Phil). … The Massachusetts Pirates of the National Arena League (a different newly-launched arena football league) have released their helmet and primary logo (from Paul Miles). 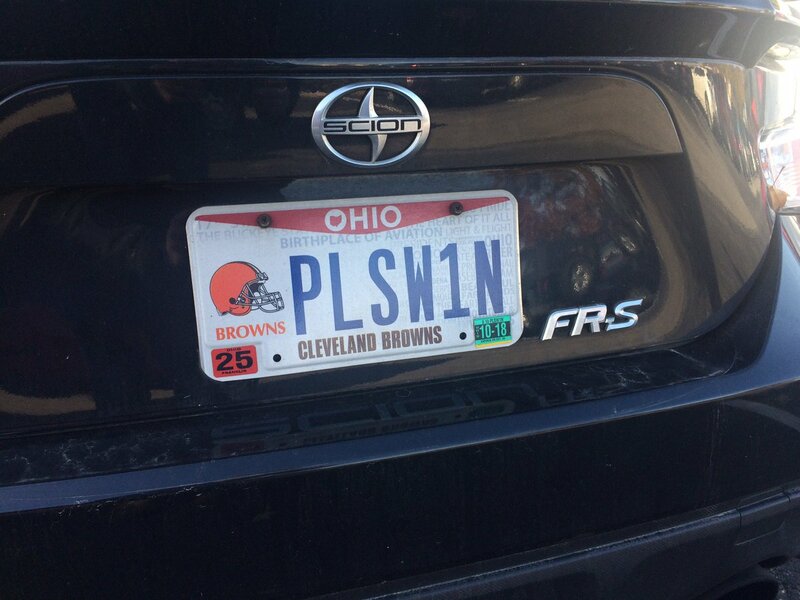 … This is perhaps the best license plate I’ve ever seen (thanks to everyone who sent that in). College/High School Football News: Steve Johnston sends along this video about Northwestern’s throwback uniforms from a few weeks ago. … Youngstown State is wearing military appreciation uniforms against Missouri State. Robert Hayes provides us with a better look at them. … Also from Robert Hayes: Pitt is throwing it back against Virginia Tech. 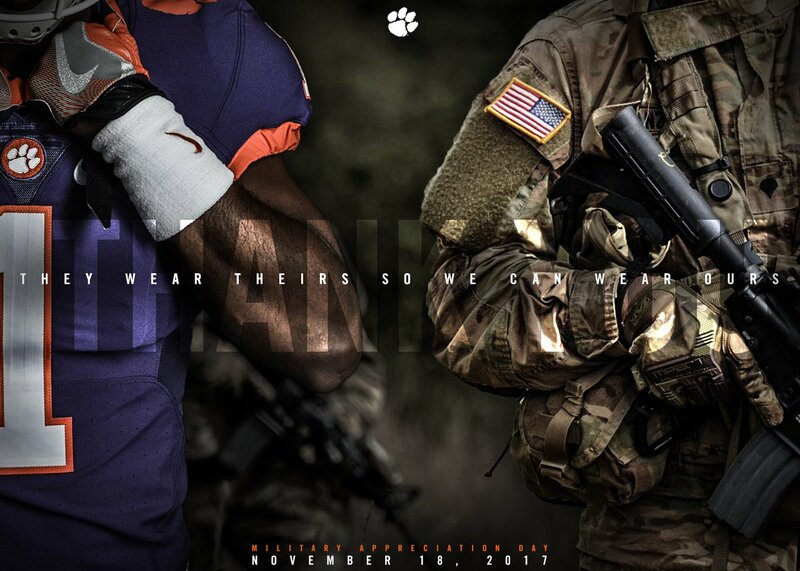 … The following are all from Phil: Clemson is wearing all purple for Military Appreciation Day. … Ole Miss is going with blue helmets, red jerseys and white pants for Senior Night. 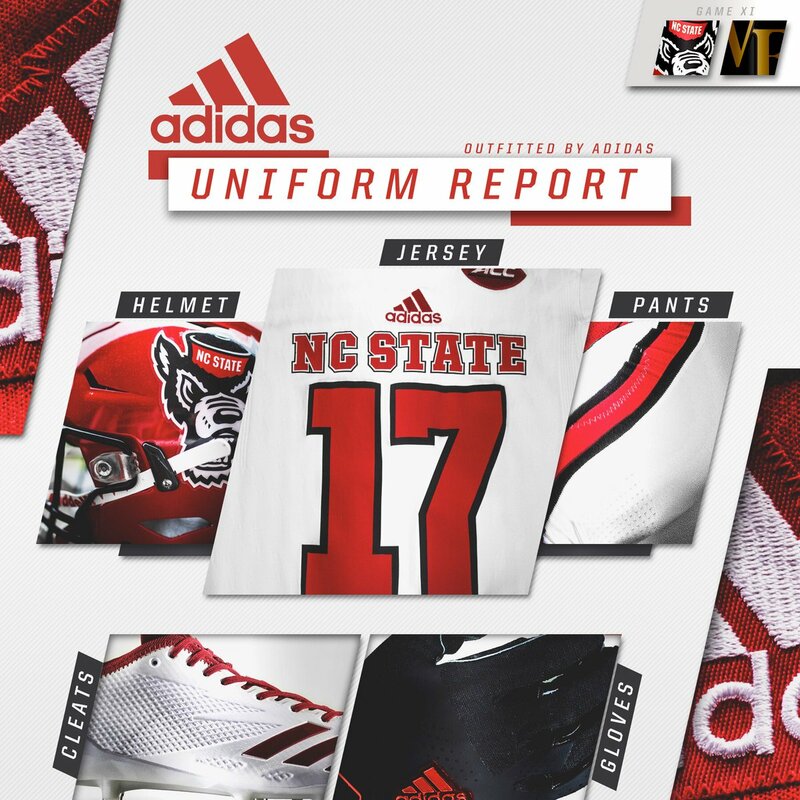 … NC State is going all white with a red helmet against Wake Forest, the same set as last week. 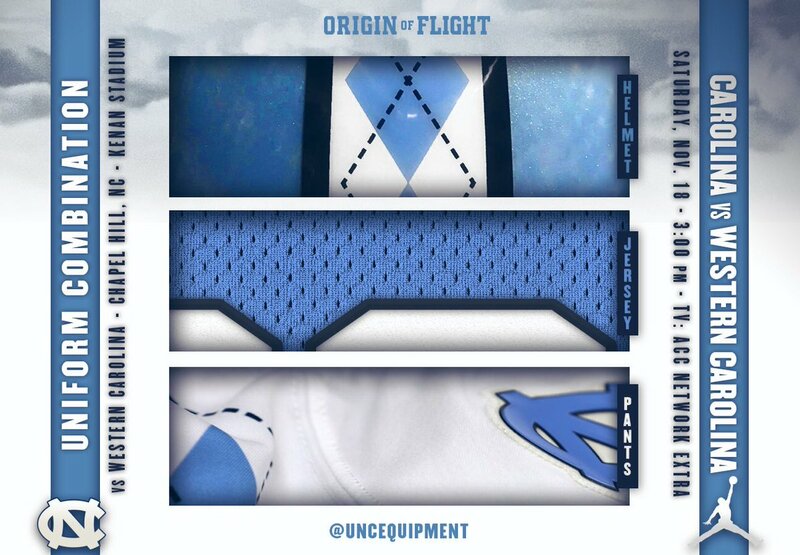 … UNC is wearing Carolina blue helmets and jerseys with white pants against Western Carolina. … Louisville is going all red against Syracuse. … Tulane is going all green against Houston. … And here’s what Houston will wear (from @igTXSalazar). 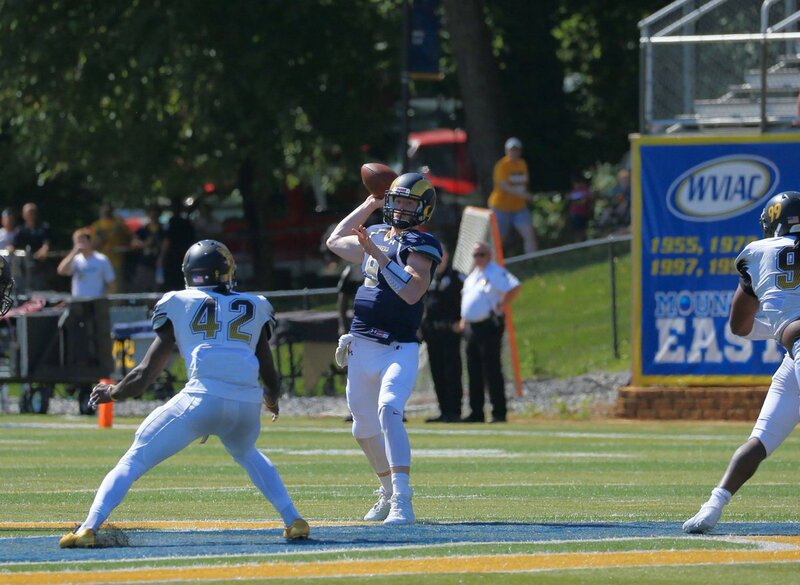 … Shepherd University is going blue over white against Findlay. 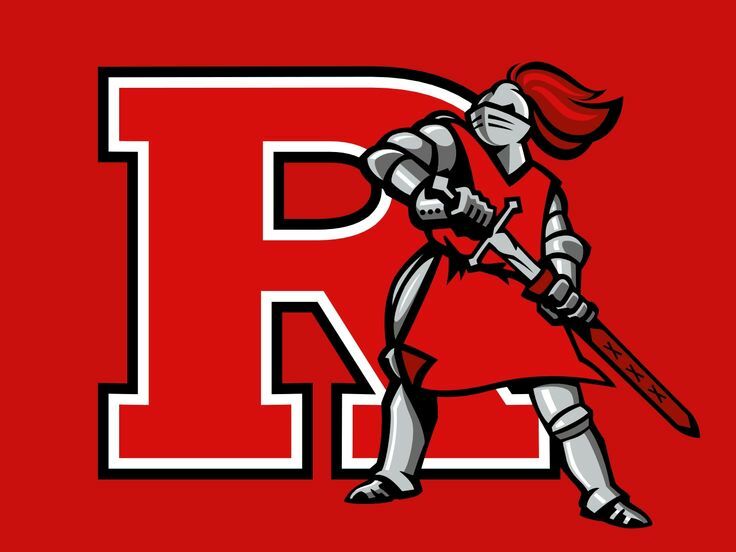 … Rutland High School of Macon, Ga., took logo inspiration from a couple sources (from Jordan Daniels). Hockey News: Also posted in the NBA section: The Wizards’ Mike Scott has a huge NHL sweater collection (thanks, Phil). 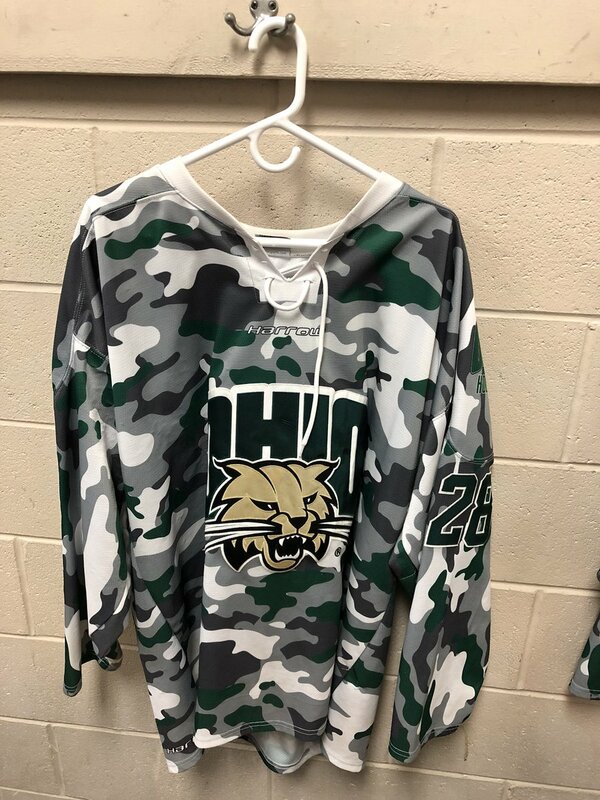 … Ohio University wore camouflage alternate sweaters for Military Appreciation weekend. Here’s the back. Those uni numbers probably got lost in the camo. NBA News: The Pacers wore their Hickory alternates for the first time this season last evening. … Cross-posted from the NHL section: The Wizards’ Mike Scott has a huge NHL sweater collection (thanks, Phil). … Alibaba (a Chinese Internet retailer) is selling counterfeit Nets gear even as its owner seeks to buy a stake in the Nets (thanks, Phil). 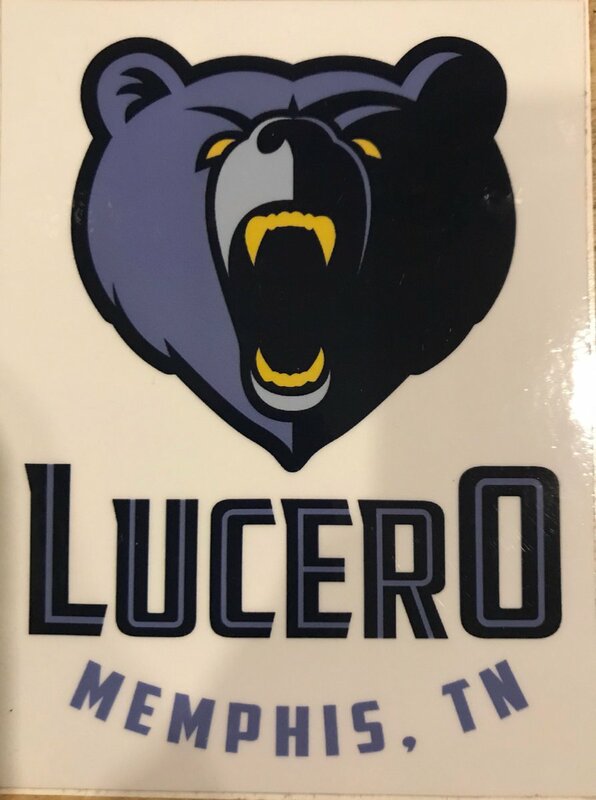 … The band Lucero had a Grizzlies-inspired sticker for their Memphis show (from Wayne Jones). 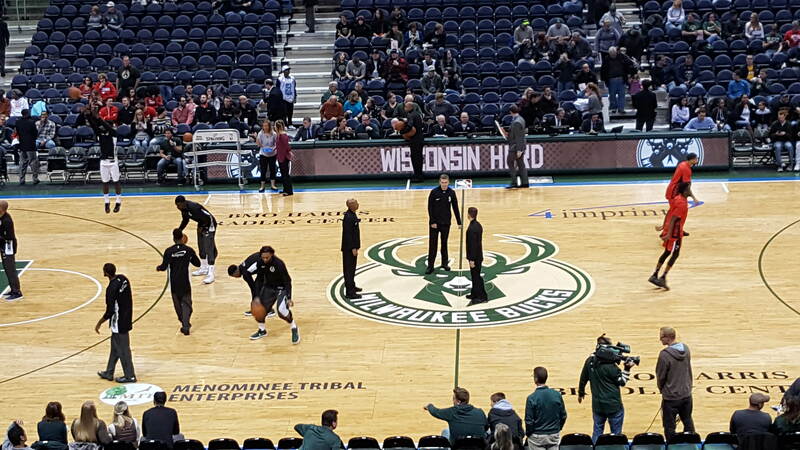 … The Wisconsin Herd, the G-League affiliate of the Bucks, played a game at the Bradley Center in Milwaukee last night, and the Bradley Center added advertisements of Herd sponsors to the Bucks court (from Zachary James Loesl). 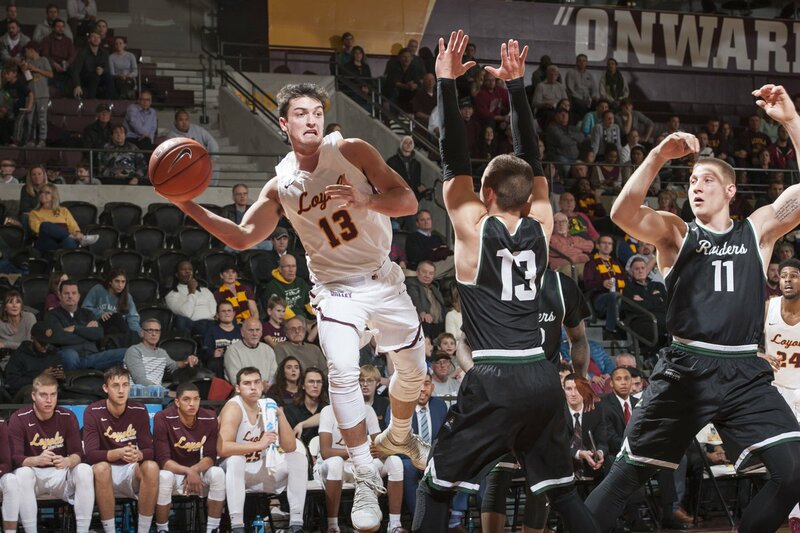 College/High School Hoops News: Loyola Chicago have the Missouri Valley Conference logo on the front of their shorts, and it seems unusually large. Compare it to Wright State’s Horizon League logo patch in the same place (from Thomas Juettner). … FSU debuted their new blue alt uniforms last night (from @fernycordal). … UConn’s new Nike PK80 jerseys are not getting the best reviews (thanks, Phil). … Florida will debut their new orange jerseys next week against Stanford. 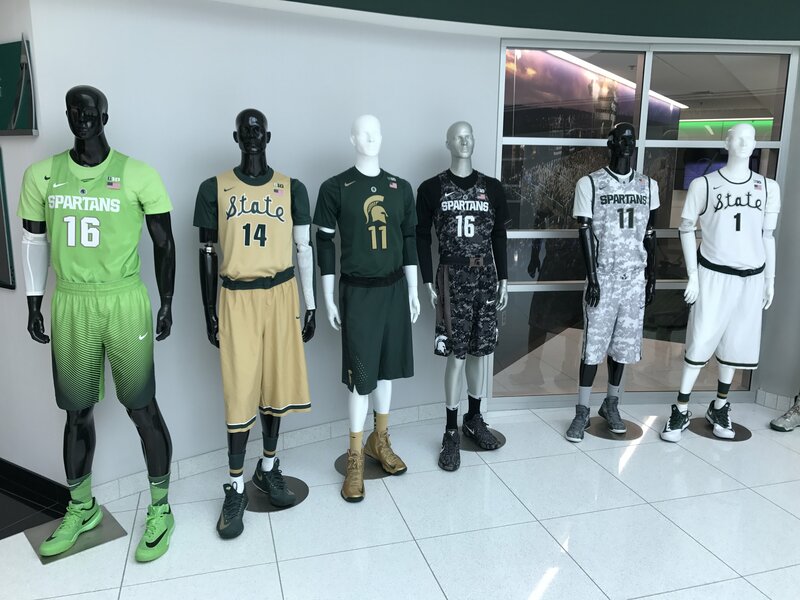 … Michigan State’s new PK80 uniform sets have been released (from Jerry Kulig). 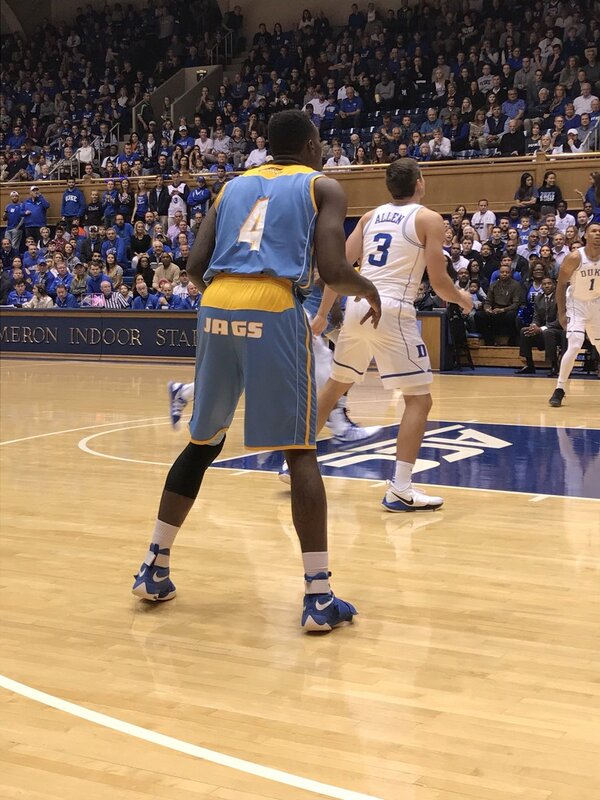 … Southern University worse some pretty terrible shorts during their visit to Cameron Indoor Stadium (from Zack Fowler). … New Home (Tx.) High School basketball have unveiled their new uniforms. A little Louisville inspiration there, no? Soccer News: VfB Stuttgart wore special all black kits for yesterday’s match against Borussia Dortmund. The kit was design by 0711 Künstlerkollektiv – a Stuttgart collective of musicians and artists (from Anthony Zydzik). … Brazil’s 2018 World Cup change kits have been leaked. … England’s World Cup primary kit has been leaked as well. … If the United States had made the World Cup, their World Cup change kits would’ve looked like this. … Nike and Adidas are unsurprisingly dominating the kits of the 2018 World Cup participants, with 22 of the 32 teams wearing either Nike or Adidas. … Next season’s Manchester United away kit will be pink. … Puma is being criticized for the quality of their Arsenal replica kits, as the sponsor logo peels away from the shirt. It’s a feature, not a bug! 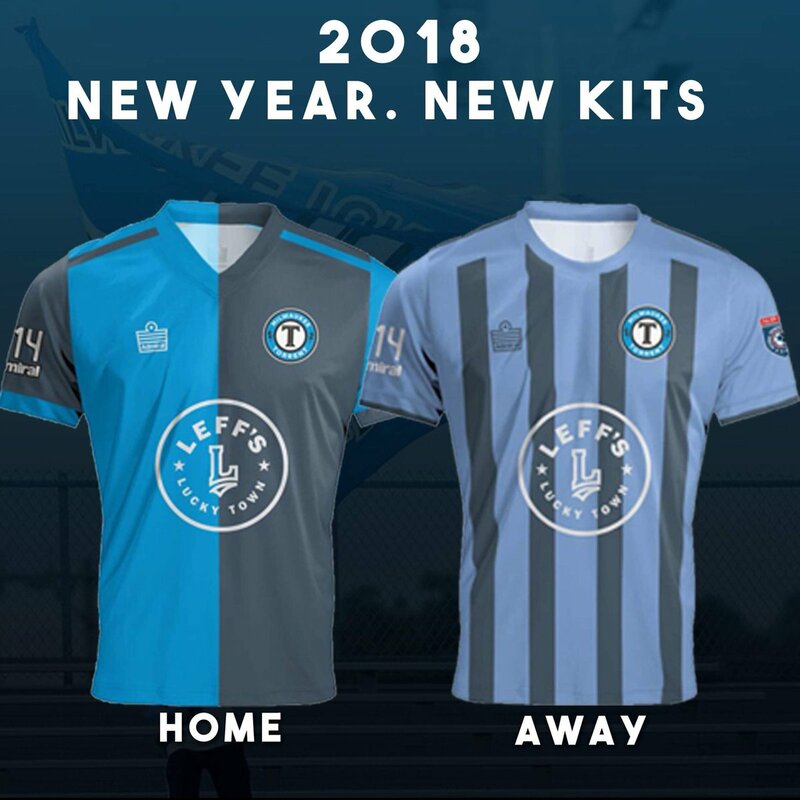 … Milwaukee Torrent of the National Premier Soccer League have launched their 2018 kits (from Ed Żelaski‏). 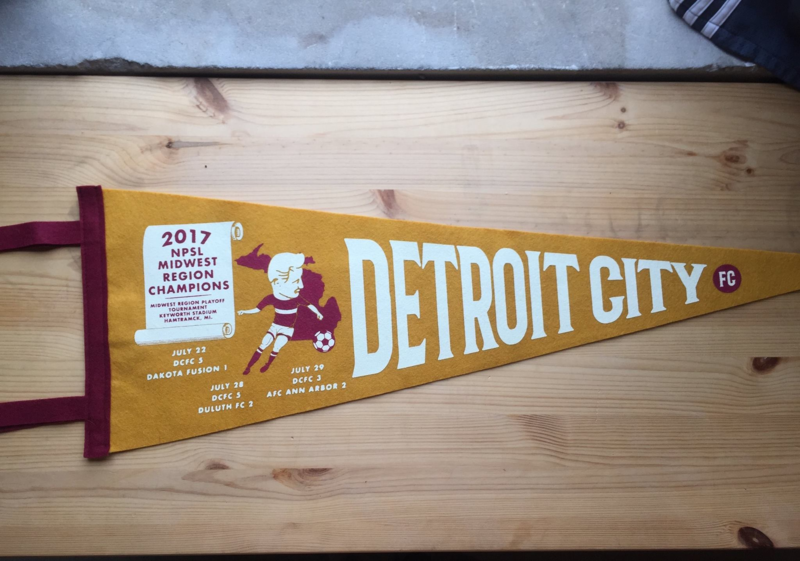 … Detroit City FC are selling a retro-styled pennant in honor of their Midwest Regional Championship (from Alex Dewitt). 18 comments to Reimagine The XFL Contest Entries – The Finalists! Ben Polizzi’s design makes a good case for creative concept being more important than flashy presentation. 2D all the way, baby. Wow, from the post the other day, looks like 4 of 6 finalists are using a 2D template. – COOL! That means we’ll probably have a 2D winner… They may still have used a nice program, but the fact that 2D designs are getting the most votes says “something” – right? Or maybe it’s just a coincidence? I count three using 3D, three using 2D. My personal favorite uses a 3D template, my second and third choices use 2D. I find that I generally prefer 2D renderings, to the point that between a 2D and a 3D presentation, the 3D one has to be noticeably better designed for me to prefer it. Yeah, you’re right after a second look. The Notre Dame Knute Rockne helmets are top notch! Love ’em! Even the ventilation holes in the modern helmet version feels kind of like a throwback nod to the ventilation holes in the leather helmet shown. The Packers’ throwbacks are post-Acme. Much to love today, from the excellent contest finalists to maybe my favorite modern football helmet design ever. But then we see the woulda-been USMNT change jersey, and now I’m almost happy USA didn’t make the World Cup. Someone at Nike really hates America. Man, even Wright State has gone BFBS. They’re supposed to be just green and gold. New Home (Tx.) High School basketball have unveiled their new uniforms. A little Louisville inspiration there, no? Why oh why would anyone want to look like Louisville? Including Louisville? Actually, the contestants were praised for *not* being predictable. It was requested at the beginning that they not take the usual “(name)y Mc(name)face” route, and they listened. My initial reaction to the Notre Dame uniform was intrigue. But that was followed by the feeling that it’s just a little too precious. That is curious how Beltran was using his righty batting helmet while hitting his 100th career home run lefthanded. Can;t find anything in the stories about the game about why it happened. Well, at least they’re not going full Mr. Hankey (mono-brown). The Seminoles “blue” uniform looks like a turquoise Native American Heritage uniform that Nike started a couple of years ago. Have they really never worn them before? Notre Dame looks fantastic. Love love love these uniforms. Look even better on the field. ND has fantastic uniforms generally (disclosure: ND fan by marriage), and these are not that different – slightly darker, and of course close up details different. Overall: excellent. Navy looks great as well. 55 NHL sweaters? That’s quite a few. 55 hockey sweaters? A drop in my bucket.